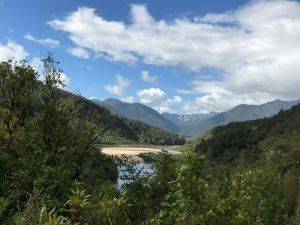 You know a ride is going to be epic when the organisation involves 3 shuttles, 3 night’s accommodation in 3 different places, a helicopter flight and 120km of riding ( the trail is 85km but we extended it ) and the planning starts 6 months out. Old Ghost Rd is not for the faint hearted, its rugged and wild, in the middle of nowhere and possibly one of the most exhilarating experiences of my life. To start the adventure off we enjoyed a week in Kaiteriteri and Nelson with our kids, then after sending them home as unaccompanied minors on the plane we were joined by a group of our friends and friends of friends because when people find out you are organising an Old Ghost Road ride they want in!! 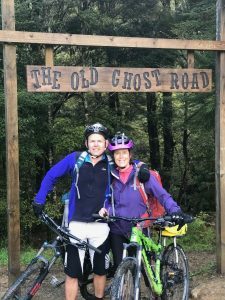 So for this blog instead of talking about the ins and outs of the trail I thought I would share what we learned about the logistics of doing the Old Ghost Rd ( along with key contact details at the bottom of the post ) with maybe just a few highlights of the ride. When we booked ( in April 2017 for riding in October 2017 ) it was so popular we found it already hard to book a suitable date in the huts on the trial. We were booking in a group of 7, that then grew to 10 so obviously, a smaller group would be easier to book. We ended up starting the ride on a Sunday to make it work as obviously Saturday starts are more popular. Since then the price/night for the huts has changed; it used to be $45 per night and now its $145 for 1-4 nights on the trail. So if you are thinking of doing this ride look at booking the huts now. Of course to book the huts you need to know where you want to stay on the trail. 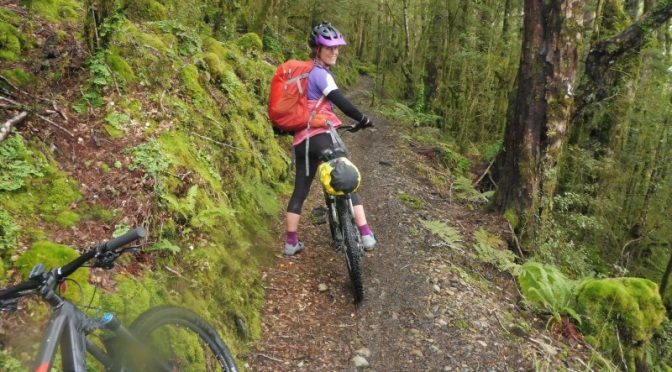 What I have realised after riding the trail is that there are many options for how you can ride it and over how many days; from once through, to there and back ( yes we met people doing that!!! ). We rode once through, Lyell to Seddonville, staying one night on the trail in Old Ghost Lake Hut and then got a helicopter back to Ghost Lake Hut ( high point ) and rode an awesome 30km downhill back to the start at Lyell. 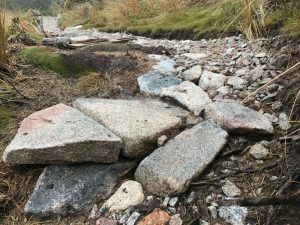 While 85km may not sound that long, it is rugged country and at times a very rocky trail ( see photo ) so it can be slow going. 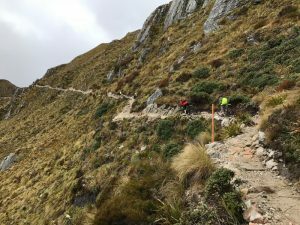 The first 30km from the Lyell end is a solid up hill and then there is the couple of kilometres across a rocky ledge that you may choose to walk. Ghost Lake Hut probably has the potential for the biggest views. I say potential because this is the West Coast of the South Island so its quite often raining or cloudy. We arrived in sleety rain with limited visibility and woke the next morning to no visibility. So we rode 30km the first day to get to Ghost Lake Hut and then 55km the second day to the finish at Seddonville. While this meant we got to enjoy a hot shower, it was a very long day and I thought the hut at Specimen Point ( see photo of view from Specimen hut ) looked lovely after 35km of rugged riding. If you wanted to ride it over 3 days this hut would be a great spot with its North West facing aspect overlooking the river and then you would have a leisurely 20km ride out on the last day. The huts are very well appointed with cutlery, crockery, pots, pans, a coffee plunger and a cheese grater. I had heard the huts were warm but wasn’t completely convinced until I woke sweating. They also have great drying racks and all the huts we stopped at had bike tools. We have ridden in large groups before and probably been lucky ( as I don’t recall good management coming into it ) that everyone could ride at a similar pace but this is a tough ride and peoples different abilities will affect the average speed a lot more. We found that we ended up riding in two groups which was fine except that in the second slower group we had one person who really hadn’t trained for the ride at all and it did end up impacting on our enjoyment as we had to ride slower and stop more often. This isn’t a ride where you can wing it, so make sure everyone in your group knows what they are getting themselves in for. As this is such remote rugged country we rode with an EPIRB. Thankfully we didn’t need it but better to be safe than sorry. Not that you need to include a helicopter flight into your Old Ghost Road experience ( but just quietly it was pretty bloody awesome ) but if you do rest assured that your bikes will be well looked after, dangling at the end of a long rope on a frame specifically designed for transporting bikes. Lots of people in our group were concerned about how the helicopter transported the bikes so I have included a video of how they do it below. Helicopter flights are most economical booked in multiples of 5 people. Oh and the trail highlights; 120km of mountain biking over 3 days in rugged terrain, breath taking scenery & stunning views, sheer exhaustion, snow, sleet and sunshine, a night in a hut perched on the top of a cliff, a helicopter flight landing on a narrow ridge, an exciting 30km downhill, one of the most challenging things I have ever done and such a massive sense of satisfaction from doing it. Lazy Cow backpackers in Murchison. Great hospitality from Ali and Phil including home baking. There is a kitchen for self-catering or there is an on-site restaurant – just check that its open. The pub across the road also does great meals. Lazy Cow do a great continental breakfast or there was a café across the road – just not sure what time it opened and we were away early. Explore Murchison to get from Murchison to the start of the trail at Lyell. Rough and Tumble lodge a great location right at the end of the trail. Delicious food, just confirm what time the chef is planning to serve dinner. This also might be the first time you have seen a washing machine in a few days – just confirm whether you can use it. 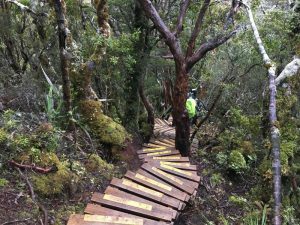 Karamea Heli-charter while of course you don’t have to helicopter, it would be a great way to ride a smaller section of the trail and it gives you an awesome perspective on the trail. Multiples of 5 people make it the most cost efficient. Nelson Auto Rentals for when we were holidaying in Nelson and Kaiteriteri. They also hire bike racks as well. Great service.